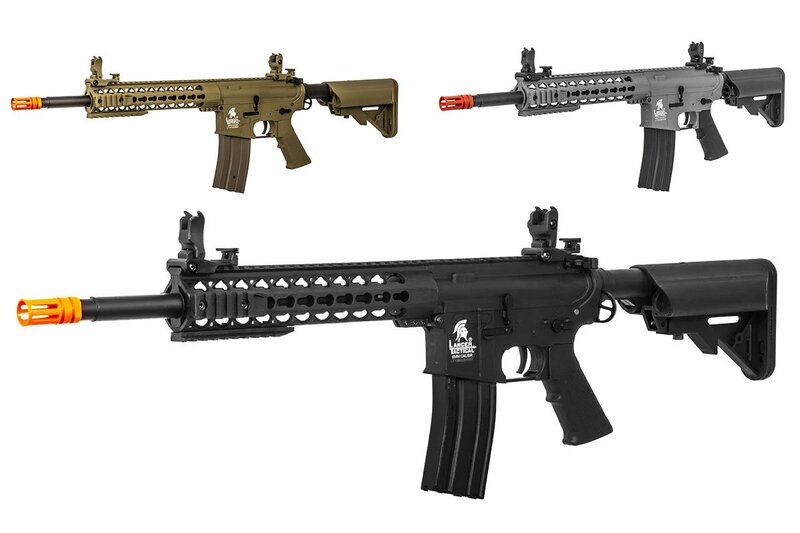 Tactically advance on the enemy position with the second generation of Lancer Tactical airsoft rifles. 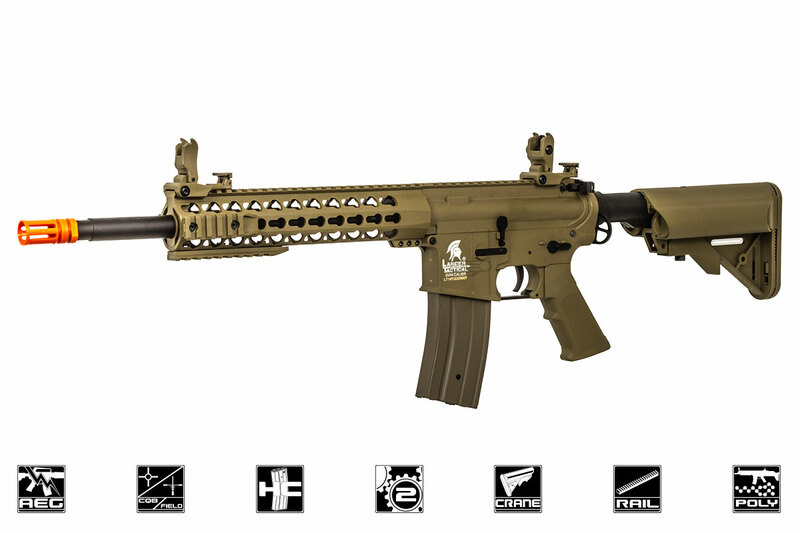 The Lancer Tactical Generation 2 M4A1 Carbine from Airsoft GI features a newly upgraded, nylon-reinforced polymer body. This super material gives you a tough, durable rifle. It's lightweight but no wimp. This gun is so light and maneuverable, you can stay in the fight longer, so you will ultimately prevail over your opponents. 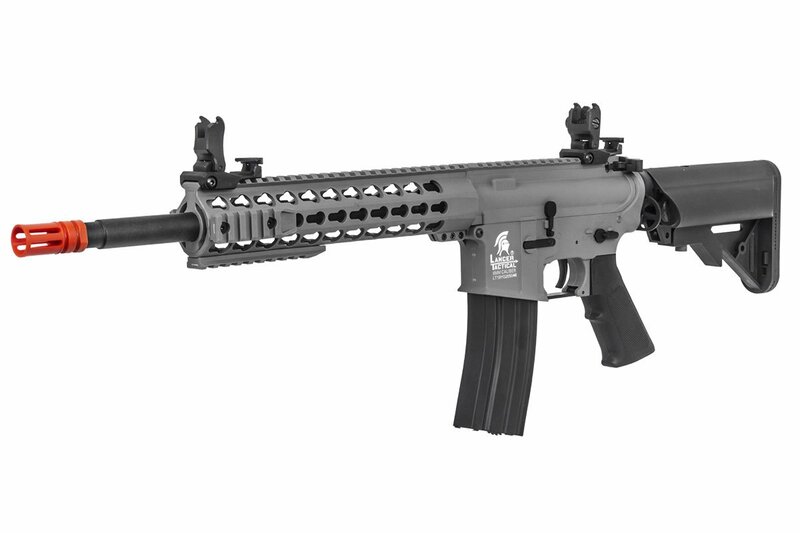 This rifle features a KeyMod-style, free-float handguard to keep the weight down. A monolithic rail on top and rail space near the front of the handguard let you attach your own optics, foregrips, flashlights, PEQ boxes and more, so you can make it truly your own. The gun also includes adjustable front and rear flip-up sights, allowing you to dial in and zero your shots and flip them down when using your favorite optic. A sling loop and a QD point are at the rear of the rifle, giving you the flexibility to use your own sling attachments to make the rifle even more comfortable to handle. Internally, the second generation of these Lancer Tactical rifles comes with standard Version 2 gearboxes, so upgrades and modifications are easy. These upgraded gearboxes include an upgraded motor, 8mm ball bearings to ensure the gears spin more efficiently with less friction, a quick-change spring system and low-resistance wiring to ensure smooth electrical flow from your battery to your rifle. The rifle also features a 6.03mm tight-bore barrel and a rotary dial hop-up unit to allow more precise, accurate shots at range. This model shoots approximately 330 to 345 FPS out of the box, making it CQB legal and perfect for close-quarter engagements. Best of all, these guns come with a high-capacity magazine, a 9.6V battery and a smart charger, making a super affordable package. If you're wondering how durable these guns are, given their amazingly low price, check out the accompanying video Cisco has made for you. Watch these tough rifles get dropped from 15 feet, run over by a pickup truck, dunked in water and even filled with mayonnaise. You might be surprised at how well they perform. 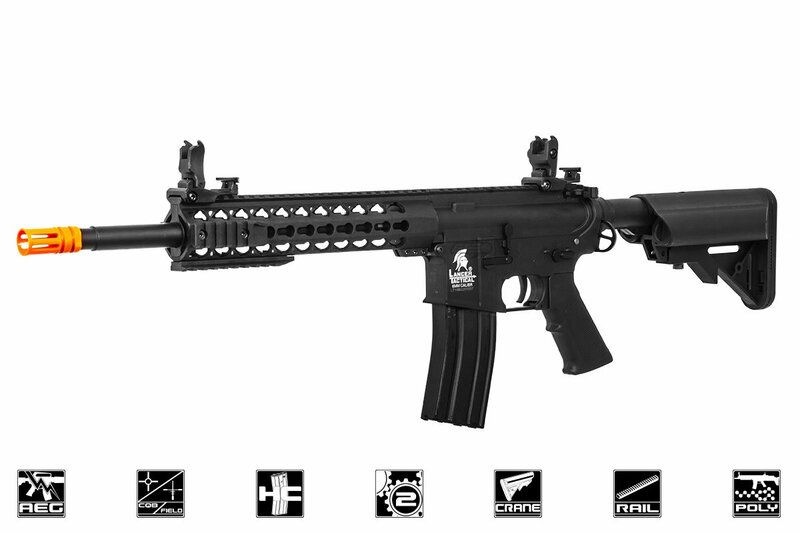 The lancer Tactical LT-19 Gen 2 M4 is a fantastic starter AEG. It comes out of the box with a 360 round hi-cap mag, a 1600mah 9.6v nmih battery, and an un-jamming rod. The included iron sights are metal (if you wanted to know) but are somewhat inaccurate. Due to this I would recommend that you get some sort of red dot or similar sight and either remove the iron sights or co-witness the red dot and iron sights. Due to the tightbore barrel and upgraded internals it shoots very accurately. The body is polymer but feels secure but unfortunately somewhat plasticy. The only con that I can think of is the iron sights and how loud it is to fire on full auto. We bought this gun as a starter rifle, and it is great! Is there a specific hop up that works for LT-19B in black or do you guys sell it on this website ? If you have modified the gearbox, it can be very difficult to find a functional hop up unit, as fitment can be changed because of the combination of gearbox parts. we recommend a pro win hop up unit, as it is very adjustable and should be able to be made to fit if it does not drop in perfectly out of the box. The polymer construction lends itself to the gun being lighter. It comes in under 5 pounds. Any 14mm counter-clockwise threaded mock suppressors will fit. Free Shipping is unavailable on this product at this time. Does this gun have a rotary hop up or traditional. I watched a video in the Youtube channel Airsftology that reviewed what I believe is this gun. but the description does not say whether or not the hop-up is a rotary or not. the gun reviewed in the video was. The Gen 2 Lancer Tactical M4's should have Rotary Style Hop Up Units.